Matthew filled a pot with dirt. “Why not? Lima beans grow. Kidney beans grow. Even green beans grow. 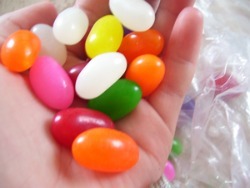 Why not jelly beans?” He dug a small hole and dropped in three jelly beans. Matthew placed his pot on the front porch. He watered it every morning. He sprinkled it with sugar every afternoon. Brooke walked by every day. “Jelly beans won’t grow,” she called from the sidewalk. A week passed. Two weeks passed. Matthew watered his jelly beans and sprinkled them with sugar. Nothing happened. It had been two weeks and two days. Matthew stepped onto the porch. The morning sun was warm. He lifted his watering can. “Hey!” Matthew yelled. He dropped to his knees and stared at his pot. Three tiny green shoots had popped through the dirt. “Jelly beans will grow,” Matthew whispered. Brooke marched down the street. She glanced up at Matthew. She opened her mouth to call. Brooke closed her mouth. She climbed the porch steps and stood beside Matthew. She looked at the tiny green plants. Her mouth dropped open again. Twice a day, Matthew watered the shoots. He sprinkled sugar on them. Brooke came to watch. “The plants might grow but you’ll never get jelly beans,” she said. The shoots grew taller and thicker. They twisted around each other and reached for the sky. Leaves covered the stems. The weeks went by. The plant kept growing but there was no sign of jelly beans. “You’ll never get jelly beans,” Brooke said. Matthew watered his jelly bean tree twice every day. He sprinkled the roots with sugar. He waited. His tree grew. He waited some more. His tree grew bigger. Brooke stopped coming onto the porch. “You’ll never get jelly beans!” she called from the sidewalk. It had been two months and two weeks and two days. Matthew stepped onto the porch. The morning sun was cool. Matthew lifted his watering can. His tree was covered with small colorful flowers. There were hundreds of them. Brooke marched down the street. “You’ll never get jelly beans,” she called. Matthew smiled. “I think you’re wrong,” he whispered. Matthew watered his jelly bean tree twice every day. He sprinkled the roots with sugar. The small colorful flowers dropped off and left tiny round beans. They were red, blue, yellow, green and purple. They grew a little bigger each day. When the beans were exactly the right size, Matthew picked them. He ate a red one. He ate a blue one. He ate a yellow one. Brooke marched down the street. “You’ll never get jelly beans!” she called. Brooke climbed onto the porch. Her eyes grew wide as she stared at the tree. I liked it so much! Cool! We loved the details, great story for our girls. I love to eat Jelly Beans!!!!!!!! I like the bit,when Mathew shouted hey come look. if there were watermelon jelly beans i'd eat it but this is so fictional but delicious yum watermelon and bubble gum jelly beans yum this was a good story. My tree sprouted pink beans! Thank you it's awesome! I used brown sugar..
i wish it was chocolate cake tree growing. Instead of a jelly bean tree I want a chocolate fountain tree and a strawberry tree. I think I will do a candy tree if I can find some candy bars. I will never give up like Matthew.This story is so fairytale! I like this story very much! A great story of beleiving in yourself! This was inspiring, we went home and grew our own jelly bean tree, the beans were amazing! one thing though, mine never grew any purple beans, is that normal? Did matthew use cane sugar or granulated sugar or powdered sugar or brown sugar? I love it. I never knew jellybeans could grow. I don't know if you write flash fiction. This would make a perfect story for that form of writing. Eliminate as many words as you can that don't propel the story fwd. I think you will have a stronger story. I love this story of faith.